P; ram .. please.. u r now a father remember. R; first let me be a husband btw my kids are in their room it s too early to wake them up..
R;Yaar , they have no school today why cant they sleep a little long. P;Usually they do but they were so exited abt their papa,, see they only need papa mumma comes later..
R: Haan . [proudly] my kids.. but yaar priya.. in all this its poor me! P: HAAN... what ... !!! AWW!!! Incomplete! U mean it.. ur incorrigible ram, what u r doing is not called as morning chores. Dont know what else u would have done to me..
Arrey priya .. been so long, u forgot .. i will make u remember, u dont know . its my duty to teach u.. Yes . mam ... !.. GOOD MORNING MUMMA , GOOD MORNING PAPA... both jumped over ram, priya went inside thinking sure he will try his best to make them sleep. She gave laptop to him and took kids along with her. ram typed a letter and got prints of it but he is not 100% liking it. he talked to her , try to convince her not to but she has decided.. it is a test to see the change in rajath. She is feeding riya n pihu running after them he caught hold of these two little devils she feed him along with them he did the same that was a beautiful family breakfast he wish for always. Yes it was his wish since the time he saw vikram feeding neha when she is pregnant apparently he was a man in love not a husband then. He blushed thinking of the most spl day of his life. Neha: Vikram please yaar its enough now , two toast two omlets, two glasses of juice, steamed veggies what's wrong with u ... this is a feast kya.. plz stop it .. i cant eat anymore.. no spice nothing yuck..
Vikram : SHUT UP am not feeding for u but for my baby ok .. chup chat eat well..
Priya: Yele ... neha leave all this eat this.. am sure u will like it.. i made it..spl permission leke ... bread burji. Taste it u will feel good. Vikram let her eat what she likes, u have to take care of her mood swings... ram dont laugh u have to tell him. Priya said..
RAM:Haan ,, ur right... vikram ur wrong..
Vikram: u first get married then will see how will u let eat junk food, u r very cautious now it slef and when priya is pregnant then ..will see..
Priya and ram looked at each other, remembering the time they have been together, for them they were a couple a married couple who literally are not married. Ram had a doubt.. opps will priya, wil she be , there is an awkward silence between them. priya excused herself and he followed her. P; dont worry, nothing of such is going to happen..
R: thank god.. that just happened and we r not yet married ..am relaxed now..
P: hmm willl not have any problem.. marry me! R: priya, am the elder son in my house so as u.know. our parents will have some wishes regarding our marriage so i want to give that happines to maa and dadi. Dadi is waiting for my wedding since long time. P: i can understand but i cant come to India as am now! I dont have anyone except u. I came from home as an orphan.. and what is there to hide from u .. i cant come to INDIA..
R: just tell me priya what is bothering u. ...y cant we go to India..
P; ram i have no intentions to hide it with u, in fact u are the only one who can understand. its truth of life y am i here today. y i was reluctant to go back. who is there for me to return. i came here as priya. i decided the same day i stepped out of my house ...[ alone tear rolled down her eye...] i came out as priya, not as priya sharma every one stared at me as i walk out till my body vanished off their view... that day .. first time i spoke to maa. Shipra: priya... Why are u spoiling ayesha's n karthik's future. I cant see my daughter unhappy. P: mein.. Kaun hu maa! S: u r not my daughter... I never wanted u.. u are bad luck to me. I lost my life because of u.. kaash that day u were not in my womb. P; tha's my fault ma! S; yes it was a biggest break to me. I fainted on the set. Doctor confirmed I am pregnant, I lost the chance to be the face of a brand..its u ur the reason. P:that's y u hate me? S: u r a badluck to me as well as my kids. Ayesha loves ram...that ram is mad he found u beautiful. If u quite ram will marry ayesha for nuts karthik will also be settled. If u want to see my family happy just back off. S: then ram should have been ur but ayesha likes him .. this is the last thing u give to me..
P: I should not have born ever. I will not come infront of u again. I am leaving for ever. I always want u be happy. She turned to ram in tears, he cupped her face took her in his arms and patted her back to console.she clutched his shirt tight continued to say- then I packed my things papa tried to stop me, but because of the promise he gave to maa he could not say a word. Pata hai ram maa should have done my shard too. One last time I turned around and said, "papa, thanku so much,shipra ji u hate me for the thing which am not responsible, am going am not coming into ur daughter's life I always pray for u and ur familiy. Ram do not know where am I going. If ram is ok to marry ayesha he will.. can u bless me once before I leave?'" I bent to touch her feet first time ever in my life she kept her hand on my head saying don't return to us as priya sharma. U are dead for me. Am an orphan,literally if we go to india I will not be able to marry u,I cant come to india . don't force me am happy if u don't marry me! All I know is I LOVE U for me u r my man. She walked away from him wiping her eyes leaving him behind in tears. They gathered for lunch, joe and nisha were not there, only ram priya, vikram neha. Ram is enjoying vikram's torture.neha is vexed of vikram's care. N: ram please tell ur friend.. galti is my mom's who asked him to take care of me. mom word made priya emotional he caught her hand moved close to her.she felt consoled. R: what is there in that neha he is being extra careful..
VI: thanku ram first time u r supporting me. N:priya yaar u tell can I eat for two, he is feeding me double than what I can eat. P: neha he is so sweet and u r complaining..btw I do not have experience so don't ask me.. Soon then waiter served their order. Ram served double than what vikram can eat. V: oy , what is this..
R; u look so weak , taking care of neha u r neglecting ur health.. common now u have to eat..
P: arrey when neha apparently can y cant u ?. U also have to be fit and fine to look after her y neha? N: exactly .. love u both..
R: BTW credit is madam's not mine..
V: stop it.. am not having it that too ghasphoos .. ewww! R: oh.. ab samjh mein aya.. neha ki problem. V: ram u don't know lot of mood swings will be there, to avoide this am keeping her full. V: haan ,, aur ram u will know that when priya becomes pregnant. R; am not like u and priya only prefers ghas phoos so I wont have problem.. I will love to feed her what ever she ask for..
R; haan .. let me be a father ..
N: helooo romeo ,,, first marry her then be a father. V: wedding,u r inviting priya too. P; u r inviting me to ur wedding!. Are u joking ram. R: no y will I joke .. u r invited to MY wedding..
P: good luck. She was about to leave ram caught her hand. She did not speak, he asked her again , u should know who is my bride? She nodded no. feeling shattered she said am not interested..he pulled her back.. she took her hand back ..... enough ram kapoor,marry who ever u want am a fool to trust u , am an idiot who blindly trusted u and.. offered u me.. have a great life ahead. 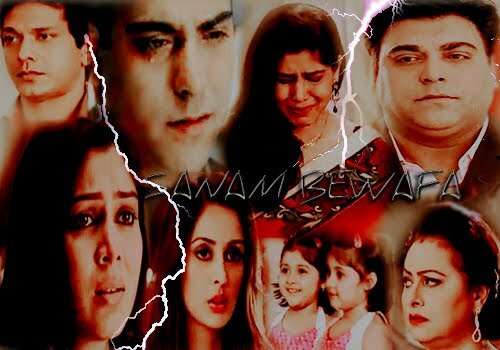 N; what ... priya u mean it... u and ram.. omg ram r u mad why have u done this to her and now u r talking abt ur marriage to her disgusting,. Neha is anxious vikram took her away while neha was shouting curses to ram he remained smiling. Priya wiped her tears. Congrats ram... She walked off.. He came out the thoughts, priya gathered courage.. she walked to wards dayijaan. Rajth came there, she gave the envelop to him . he saw it he was expecting it. Rajath firmly asked are u shifting to india. Ram intruded, saying no. He want to find a big house for them as in status of RK they will stay there till his business in malls stabilizes. Rajath gave a meek smile. Genuinely ram asked rajath's help to find a best Realtor,on dayijaan urges ram accepted to shift.in rajath;'s place. Rajth is helpless he felt happy to have priya in front of his eyes ram is happy that his plan worked. Next step is awaiting for rajath. Ram asked dayijan is there any extra room for his guest for whom he wanted to shift. Ram requested her to accommodate them and he is fine in priya's flat. Ram's guest who the hell r they rajath suspected.he felt sad the same time coz of the delay of priya to shift to his house.